Knowing how to buy an energy efficient propane furnace can keep you from making a costly mistake. The new, highly efficient propane furnaces are about 92-94 percent efficient, and the prices are reasonable. These energy efficient furnaces cost about fifty percent less per BTU to run than electric or wood, and supply warm air at consistently higher temperatures than any other heat source. Propane is environmentally friendly and, best of all, if you have a power outage you will still have heat. A propane furnace is a great addition to your energy efficient house. Of the three of these, the central furnace is the most versatile and energy efficient. The new models can be easily operated with a remote control from anywhere in the house, the venting systems are easily adapted to many types of structural situations, and can be vented vertically, or horizontally, and even vented with PVC. The units are compact and can be fit in to the smallest area. Because of the way the propane furnace is designed so that the burner is in use, only when you need heat, conserving your propane use. 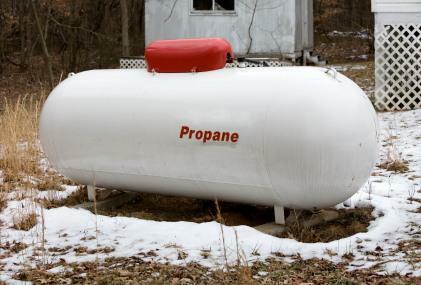 If you have not had propane before check and make sure it is available and what the cost is. You may find that ultimately you need another type of heat. Access the changes that you need to make in your home's insulation and update it if necessary. Now is the time to buy doubled paned, thermal windows, caulk around door and window openings, and replace door sweeps for best energy efficiency. Contact your contractor to assess your needs. He should be fully licensed for heat and air conditioning. He can ultimately save you money by suggesting the smallest size furnace that will do the work you need it to do. He can also tell you if any piping needs to be updated before the furnace is installed, and alert you to any possible problems and expenses you weren't planning on. The dimensions of your living space, or square footage, will determine the size furnace you need. Be sure to have the dimensions written down when shopping for energy efficient propane furnaces. Keep in mind your contractor's suggestions and information about the pipes. You can save money by buying a furnace that can utilize the existing pipework. If you are upgrading from oil to propane make sure that your contractor is licensed, and has the knowledge and experience, to do this work. Look into the tax breaks and credits that you are eligible for with your new energy efficient furnace. Some furnaces are eligible for more benefits than others and it is good to know before you buy. Choosing a different model could save you a significant amount of money in the long run. There are also special, low interest rate loans for updating old systems. Check with your local energy company to see what is available. Do a search online as well, so that you don't miss anything. The 2005 U.S. Energy Policy Act allows many incentives for homeowners to upgrade the energy efficiency of their homes. Look for the Energy Star label. Appliances that carry this label must fulfill many requirements and they must display the estimated energy usage and costs on the appliance. By researching how to buy an energy efficient propane furnace, you will arrive at the dealer with confidence, make your choice more easily, and have a better chance of getting exactly what you want.